Rear Admiral Pamela Schweitzer, chief pharmacy officer of the Commissioned Corps of the U.S. Public Health Service and assistant U.S. surgeon general, recently spoke to students in Samford University’s College of Health Sciences as part of McWhorter School of Pharmacy’s inaugural Dean’s Distinguished Lecture Series. The lecture series was created to bring national thought leaders to Samford’s campus to speak on contemporary topics related to health care as well as the profession of pharmacy. The event was cosponsored by Samford’s School of Public Health in honor of National Public Health Week, and Schweitzer proved to be the perfect inaugural speaker as her wealth of knowledge and experience spoke highly to both the profession of pharmacy and public health. 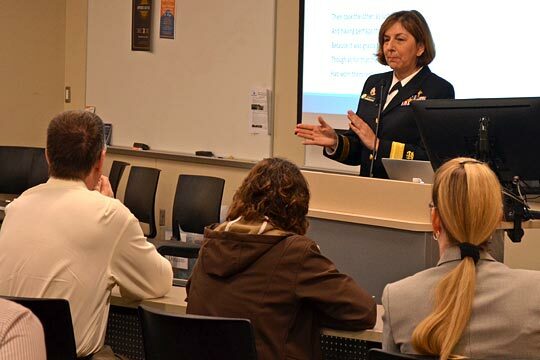 In her role with the national public health service, Schweitzer told students her focus is on changing the culture of health through leadership and support of the U.S. surgeon general’s campaigns and initiatives. But this is not a role she does on her own. Initiatives such as treatment for addiction, mental health and nutrition require leadership and initiative from all government agencies. “This is important because we are focused on working with communities and using relationships to facilitate change,” she said. Schweitzer shared stories of the many paths her career has taken. She explained how conversations with a community brought about a needed change in the attitude of the community’s health care providers. At the time, Schweitzer was working with Pima Indians on the the Gila River Indian Reservation in Arizona. She said the tribe had many complaints. They wanted a better health care system and better providers, and Schweitzer was working to help make this happen. But in a tribal meeting, a woman stood up and proposed a change Schweitzer did not anticipate. “They wanted people who would care for them, talk with them and were a part of the community. They didn’t want a health care provider that thought, ‘Let’s do this and move on.’ They wanted someone with compassion,” she said. Schweitzer is an avid hiker, having climbed Mount Kilimanjaro twice. She told students that working with the national public health service is a lot like climbing a mountain. She went on to explain that people aren’t always ready for change. Like hiking a mountain, the process is slow, but you need to keep moving. “It’s one step at a time,” she said.